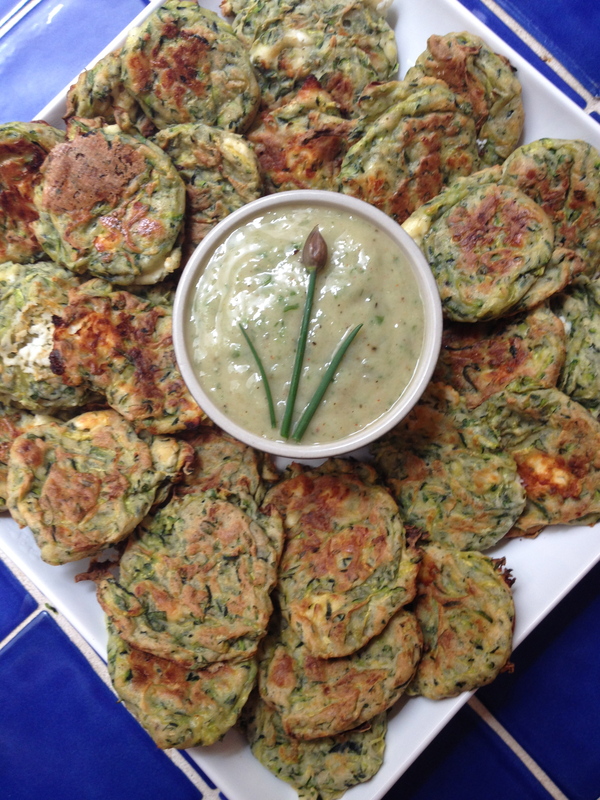 Just last weekend, I made these tasty spring appetizers. My husband and I were invited to a potluck Easter dinner. I wanted to bring something for the sensitive foodie so we could all enjoy a healthy living snack before our meal. I opted to bake these in the oven at 400 degrees to get them crispy brown instead of frying them in oil like typical fritters. I would definitely make these again! Shred zucchini in food processor (super easy way). Place shredded zucchini in colander and sprinkle with ½ TBS kosher salt and toss well in order to pull out as much water out of the zucchini as possible. Let sit for 10 minutes. Taking small handfuls, squeeze out as much water as possible. In a large bowl, beat together the eggs, dill, parsley, and ¼ cup mint. Then add the gluten free all-purpose flour. Add in the shredded zucchini. The batter should be like a “just moist” pancake batter. If it’s not, then add in another ¼ cup of gluten free all-purpose flour. Finally add in the crumbled goat cheese. Using a small non-stick frying pan – drop one scoop of the batter onto cooking surface. Cook just like a pancake. Taste test – add more salt to the batter as desired. I prefer to go a little light on the salt. Prepare a baking sheet with parchment paper or use one of those handy silpat mats. By heaping tea spoonful drop fritters leaving about ½ inch in between. When all the fritters are on the baking sheet, dip scoop or back of teaspoon into water and flatten out the fritters. Bake in oven for 3 – 5 minutes per side or until slightly browned. Make dipping sauce. Puree chopped cucumber and stir in yogurt and remaining 2 TBS of mint. Season with salt and pepper. I did try to make a dairy free dipping sauce using almond breeze plain almond milk yogurt. After I opened the container, I remembered the light brownish color and the sweeter taste. BUMMER! I didn’t have a back up alternative. Oh well, I prepared the dipping sauce as directed above. To offset the sweeter taste I added in chives and cumin but it still had an off-putting taste (to me). I have not found a true non-sweetened type of non-dairy soy free yogurt alternative that I like yet. If you have one please let me know! 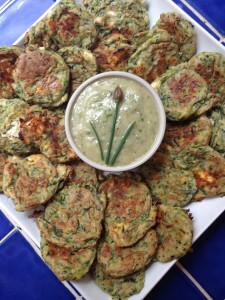 The zucchini fritters are a delish spring appetizer without the dipping sauce anyways.